Buying something from The Wheel of Time® for a someone (or yourself) for Christmas? Great idea! Note: While our products (collectibles, apparel, posters, calendars) will be packed and shipped the same day if ordered by 2 p.m. EST, we cannot guarantee exact delivery dates due to heavy shipping volumes and any issues the carriers may experience. Ta’veren Tees will not refund or replace packages that arrive late or are lost by the postal service. Orders placed by the dates below will guarantee your order is created and delivered by Dec. 24th. Badali keeps a stock of their most popular items in sterling silver for immediate shipment. In-stock items will ship the same day or the day after the order is placed. Note: Badali Jewelry cannot guarantee delivery before Christmas for USPS International First-Class, USPS International Priority or USPS International Express delivery. The delivery time is dependent on the shipping location. Happy holidays, and thanks for shopping at Ta’veren Tees, TheWheelofTimeStore.com! We are extremely excited to announce the release of not one but TWO new products at www.TaverenTees.com: The Two Rivers Longbow Champion Tee and the 2015 The Wheel of Time Calendar. We know that no one can beat Tam al'Thor in the Emond's Field archery competition. We have faith that you, however, can come close. In fact, becoming a Longbow Champ is easy. All you have to do is head to TaverenTees.com/longbow for the men's/unisex version and TaverenTees.com/longbowladies for the fitted women's style. 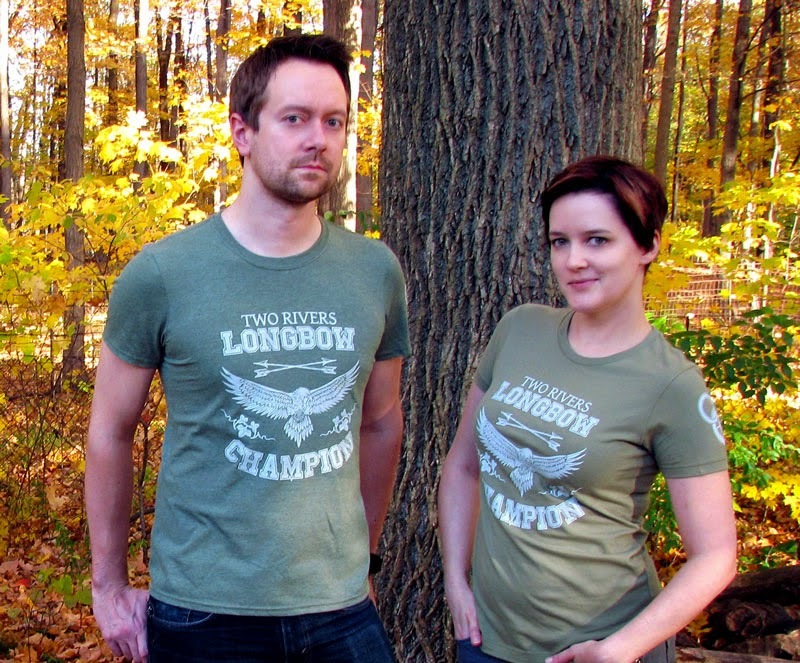 The Two River's Longbow Champ design came in first place in a recent survey we posted. Thanks to you, it is now available for PREORDER. Preorders get 10% off the original price of $24 or $26! All preordered shirts will be shipped on November 18th when they are available. Other items purchased with this shirt will be held and shipped at the same time. 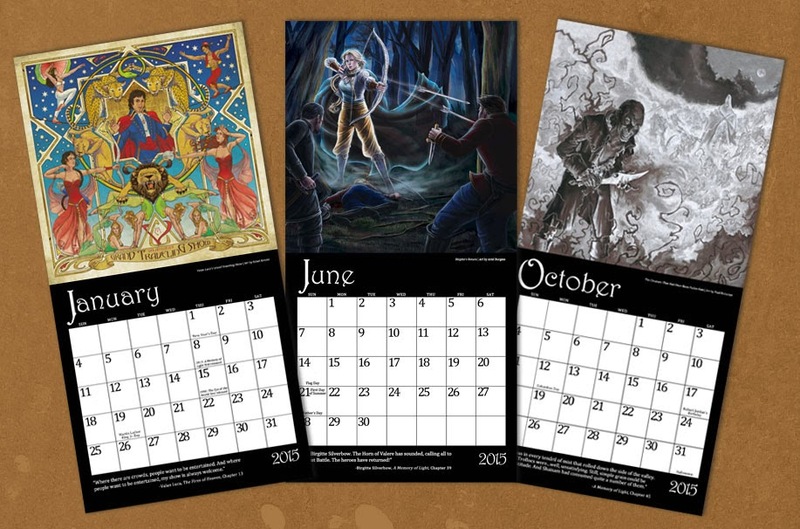 There are neither beginnings nor endings to the turning of the Wheel of Time... but you should still grab the official Wheel of Time calendar before 2015 at TaverenTees.com/15calendar. This 2015 WoT calendar measures 12" x 12". It features thirteen memorable scenes from across the series (including A Memory of Light) drawn by officially licensed WoT artists Edsel Arnold, Paul Bielaczyc, Ariel Burgess, and Joe O'Hara. It runs from January 2015 through December 2015 and includes U.S. Holidays and significant WoT dates. Orders of the 2015 calendar will receive a free 2014 calendar while supplies last (leftover 2014 calendars are very limited). To keep up with even more upcoming product notifications and holiday sales, make sure to watch our Facebook page and keep an eye on TaverenTees.com!